Eating almonds is definitely good for your health but, recklessly feasting on almonds might negate most of the goodness in almonds. To begin with you need to understand how almonds should be eaten, the wrong way could significantly reduce the health benefits that the nuts provide. In many cases, you would hear that not taking off the skin adds to the nutrient value of the food. In the case of almonds, the thin brown skin on top of the seed has a special purpose. Nature wanted the skin to protect the almond until it was ready to germinate, scientists understand this well. But for those of us who eat almonds to better our health, the skin on the nut actually holds back some of the nutritional benefits that are present in the nuts. What this means is that, the skin on the nut needs to be taken off before it is eaten. In their dry form taking off the skin from an almonds is surely going to be a challenging task. A dry almond is quite hard and you would end up, damaging your finger nails trying to take off the skin. Let us explain an easy process in which the skin can be neatly and quite effortlessly separated from the rest of the almond. Skinning almonds is not a very difficult task, soak the almonds in hot water for about an hour, the skin should then come of easily. Interestingly the soaked almonds provide another benefit too, the nuts become a bit softer since they absorb some water too. Soaked almonds with their skin taken off are easy to chew and digest. This is especially useful when almonds are being given to children or the elderly. Just remember that we are not referring to almonds that have been processed to make them sweet or salty etc. Many experts recommend keeping a few soaked and skinned almonds on hand, you can then eat a few when hungry. Important: Before we get down to listing the health benefits that almonds bring, let us clarify something very important. Though almonds have been credited with some very impressive health benefits, it is not a good idea to try and treat medical conditions on your own. Almonds do add calories and if you are on a diet, adjustments will need to be made in your food configuration to safely accommodate the calories from the almonds. Consult your doctor and explain your plan of including almonds (frequently) in your diet. Soaked almonds help the nuts release a special enzyme, this enzyme helps in the digestion process. Almonds make you feel full for a longer period, this reduces the urge to eat a lot. The heart benefits because, almonds reduce bad cholesterol and work to increase good cholesterol. Vitamin E present in almonds, makes them a good source for antioxidants. Some experts claim that, almonds help fight cancer and can also help suppress tumor growth. Almonds help maintain glucose levels, they are also believed to regulate high blood pressure. Soaked almonds are a good source for folic acid, this has a positive impact on your health. Almonds are often sliced or cut and added to various food dishes, almond milk is another way in which you can derive the health benefits of almonds. Many bakery items have sliced or finely cut almonds put on the top. Recipes that include almonds during the cooking process, might result in a loss of some nutritional value in the nuts. Salted or sweetened almonds are definitely left out of this report. The salt and sugar added to such almonds might enhance their taste and flavor but, they could also bring their negative effects into your diet. If you plan to eat almonds regularly as part of your diet, discuss your ideas with your doctor. The Almond Nutrition Report, has more useful information related to this topic. A classic sapphire and diamond ring, you can order a sapphire gemstone ring in gold or silver as per your design or ours. Choose from white, yellow, blue, pink and green sapphires. Our sapphire ring collection has more ... here. 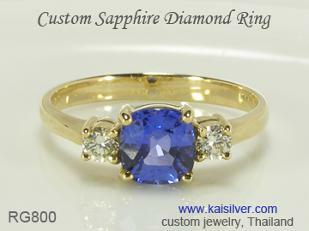 Custom rings from Kaisilver, crafted with your design or ours. 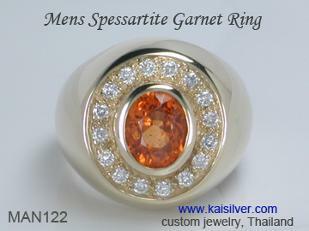 Your choice of design or gemstones is not restricted to what you see on our websites. Review some awesome high end gold and 925 silver rings ... here.